Add flour, baking powder, and baking soda to a bowl. Whisk to combine and set aside. Add eggs, sugar, vanilla sugar, salt, and buttermilk to a separate bowl. Using a hand mixer, beat until combined. Whisk in flour mixture and oil until a smooth batter forms. Melt butter in a large frying pan over medium heat. Grease cake rings with some butter and place in the frying pan. Fill rings two-thirds of the way up with the pancake batter. Fry pancake in the dessert ring for approx. 4 min. then flip with the ring and fry on the other side for approx. 2 min. more. 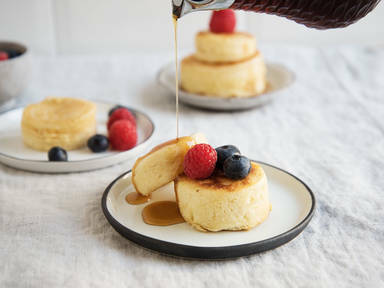 Carefully remove the pancake from the dessert ring and serve with maple syrup and fresh berries. Enjoy!